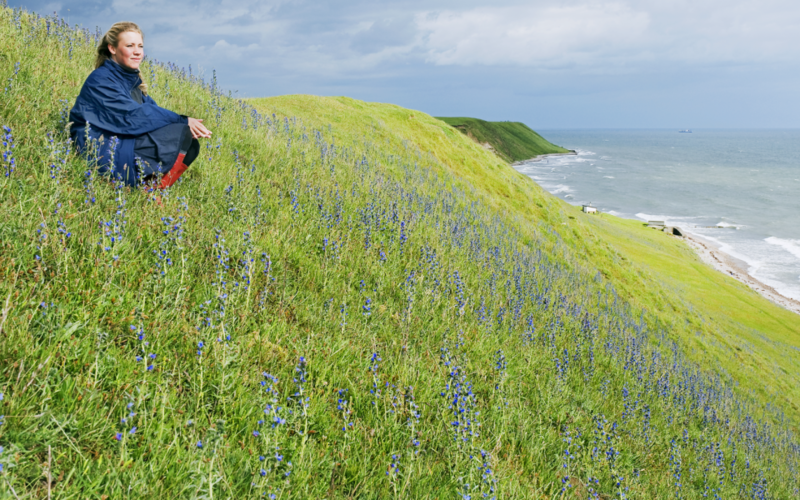 Rolling hills, open pastures and an unhindered view over the Baltic Sea along Skåne’s southern coast. Wander the coast or the crests of the hills, sandy influences everywhere. 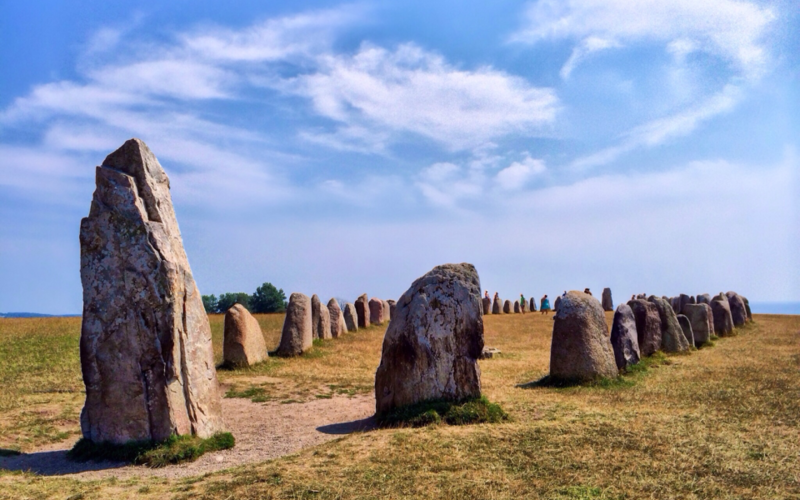 Do not miss Ales Stenar, a megalithic stone ship setting on the top of Kåsebergaåsen Ridge, oriented to mark the winter and summer solstices. Your starting point is the little village of Nybrostrand, where you can stock up on supplies before heading down to the sandy coastal path. East of the village you follow a bicycle path around the Kabusa rifle range towards the Kåsebergaåsen Ridge and the hills of Hammars Backar, known for their beautiful nature and views of the Baltic to the south and the plains to the north. This is an unusual sandy steppe habitat, covered in cowslip, pasqueflower and many other sweet-smelling herbs which butterflies love. It’s also a great place to watch migrating sea birds in the spring. Follow the ridge east, climbing over a few stiles here and there. Kåsebergaåsen Ridge was created by retreating ice some 15,000 years ago. Its sides are under constant attack from the sea and the slope is getting steeper all the time. After passing through the little fishing village of Kåseberga, you follow roads on the outskirts of Löderups Strandbad and along a path past the species rich heathlands of Backåkra and to your campsite at the coastal woodland in Hagestad Nature Reserve. The traditional farm with four long houses at Backåkra was bought by Dag Hammarskjöld, the UN Secretary General between 1953 and 1962. His goal was to conserve the unusual heathland and in his will, he left all the land and Backåkra to the Swedish Tourist Association. Today, pine forest has been planted to bind the sands of what is now the Hagestad Nature Reserve, Hammarskjöld’s legacy. Löderups Strandbad is built on the old sandy seabed. Storms and waves often wash away parts of the shore, and sometimes even buildings. 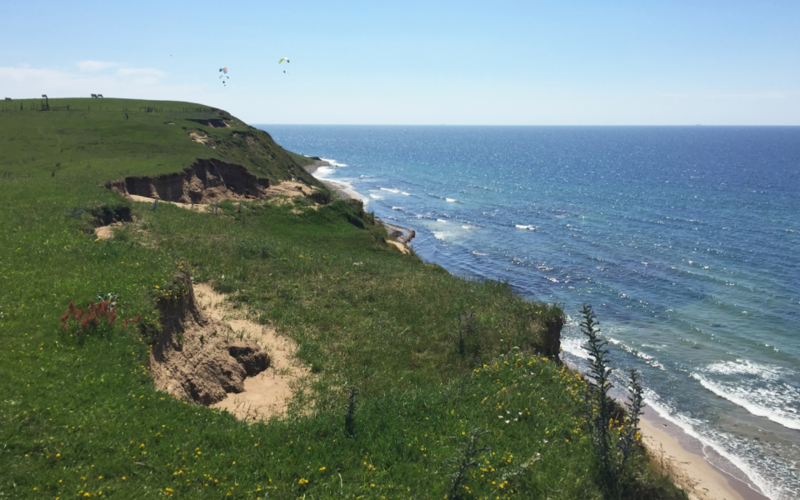 The severe coastal erosion has received a lot of attention in recent years, and the municipality of Ystad has brought in sand to counteract the loss of sand, a large part of which gets deposited at Sandhammaren, a few kilometres to the east.